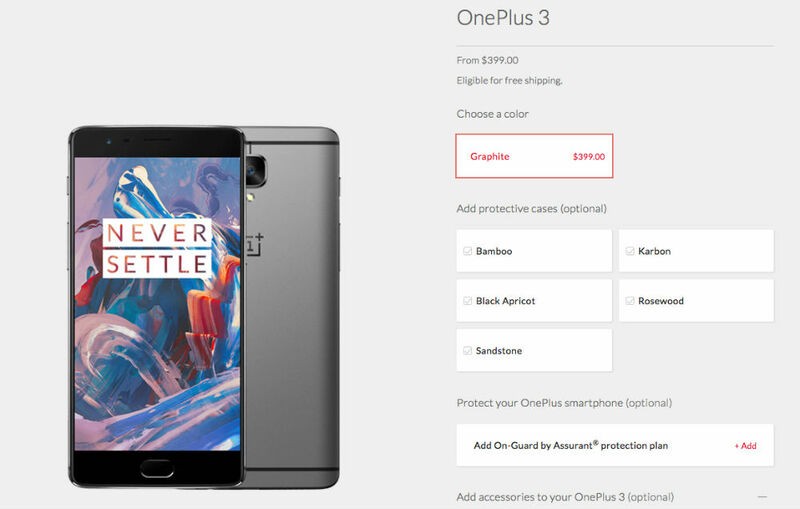 The OnePlus 3 from OnePlus is now available for purchase on the OnePlus website, no invite required, just the way it should be. As of right now, only the Graphite Grey model is available for $399, with no sign of the Gold. OnePlus also has a few add-ons you can buy, such as protective cases for $25 a pop or Dash Charge bundle kits for $33. Buyers can also throw in a protection plan from Assurant, starting at $20 for 12 months of additional protection. The most expensive protection plan is $80 for 24 months, covering your phone from drops, cracks, and other accidental damage. As for shipping, the OnePlus site is doing much better at being transparent on ship times. Currently, if you order right now, the device will ship within 4 business days. For free, you can have your new OnePlus 3 by June 25. For Priority, you can have it by June 22. Priority costs an extra $10. If you are ready to take the plunge, follow the link below.